WhisperWood Cottage: Don't Rate My Space! lease, I implore you, do NOT rate my space! We all know the magic that Angelo Surmelis performs on Rate My Space each week. Yeah, Angelo, if you're listening, my room needs help! Well, I'm sure Angelo is busy, so RJNJ and I are on a mission to fix up this bad boy of a room. It all started when the shelving in my closet finally gave out for the last time. 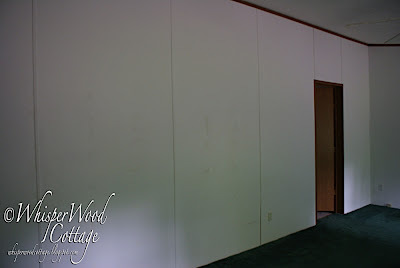 Do you see below where the previous owners had used plexi-glass to reinforce the wall? That's only the beginning! 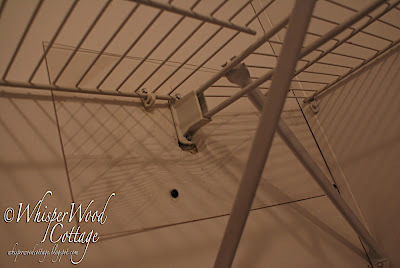 This photo doesn't show you how metal parts have simply crumpled and screws have been mercilessly pulled from the wall. (Does it sound dramatic enough?) It was the last straw! 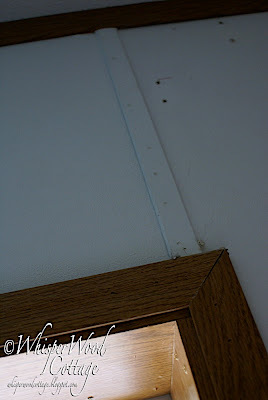 We (okay...I) have been planning a makeover for this room since we moved in...three years ago. 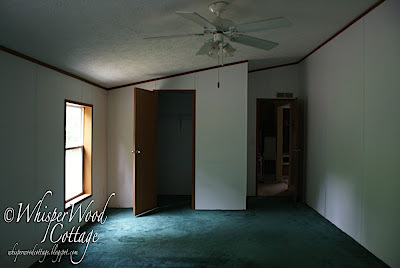 However, the kitchen, dining room, living room, hallway, guest room, office, and workout room all got overhauled first. Now we're on to the master bedroom...finally! Ummmm....I can't think of any more. It has carpeting. It has forest green carpeting. Yeah, nice but not my thing. I've always dreamed of wood floors...in every room!! Oddly low windows. Makes furniture placement difficult. The walls. Have you seen the walls? Those strips are what the builder did in place of taping and mudding the joints. Our whole house was like that when we moved in. Not enough storage space. The closet is a walk-in, but yeah, um...there's only room for one person's clothing. Remember, we have winter and summer here...so we have lots of different clothing. Since, we don't have a basement or other adequate storage, it ALL stays in our bedroom year-round. The trim. Oh, the trim. Can you see it? Yeah. Feel my pain. The good news is that work has started. Believe me! It's pure chaos! Everything that was in that room is now spread around every other room of the house. Our dining room has become our temporary closet, so the dining table has been moved into part of the living room. We are sleeping in the guest room and all the extra pillows and duvet are piled on top of my pretty blue chaise I recently showed you. The price we pay for beauty! Any words of wisdom for the renovators? What would your vision be for the space? What do you think we could do with it? P.S. Angelo...darling...we still have a master bathroom and an entry way to do. If you can't work us into your schedule, could you please send over Genevieve, Vern, David, or Candice? Or if you happen to know Sarah, she's one of my favorites! Thanks! You're a doll! Two closets. Both extend from the side of each window to each short wall...this will extend the existing closet. I guess that is the bathroom door on the opposite end from your existing closet. It will just be a long, wall closet...maybe mirrored sliding doors for access. They can be clean and neat...and extend the room that is going to be shortened with reflection. My first instinct was to place the headboard between the windows, but the slant of the ceiling changes that. Does the attic allow for the pitch of the ceiling to be changed to "even"? If not, Darn! Wanna drop the ceiling so that it's all even? If not...a wall of windows is in order. The windows. First floor? What do they look out on? A wall of windows comes to mind, or patio doors or french doors...depends on what is happening outside. The obvious. Ditch the strips. Ditch the tiny trim. 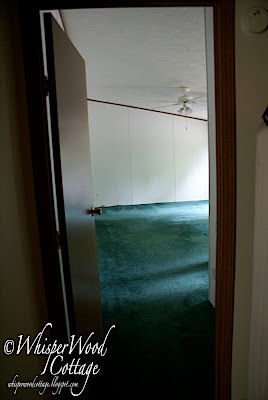 Ditch the carpet. Donate it. Someone might like that green. If I just spent your budget, keep the closet, as is, and buy a couple armoires and cedar chests in a style that will fit your existing furniture. Can't wait to see the transformation! That looks like vinyl-clad sheetrock. Do you have metal stud framing? Floor to ceiling drapes or curtains to begin with...maybe the whole wall? 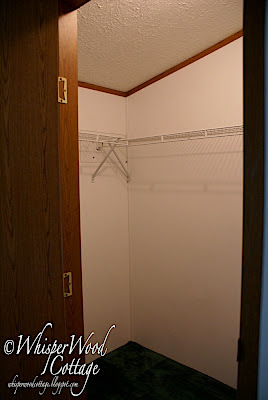 Are you willing to give up walls for closets? Maybe think out of the box for clothing with open shelving within the room. Will you have a tv in the room (I vote no on that one)? I just saw a redo on someone's blog with odd height walls. I'll try to find it for you. The end result was fantastic. You've got a clever mind and I know you will dream up something beautiful. You probably had something in mind before stripping the room, right? What about the ceiling fan...staying or going? Decisions, decisions! 3. Walls, ceilings 4. Trim 5. Closet....in that order and as you can afford it! Get what it is that you really want! OMG ! Your room looks almost identical to my MB. Except, my windows are a little higher and we have an old fashion closed (not a walk in) I have to store my out of season clothes in trucks or outside in an outbuilding - no joke. 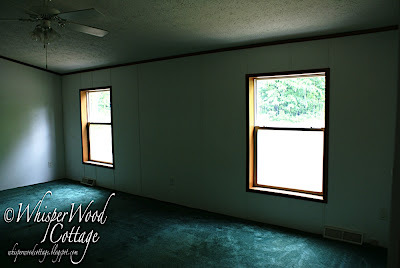 We gutted the room down to studs, replaced the drywall , windows , carpet and added oak trim. I wish the room had been a little larger to add a walk in closet.I hear you sista - it is a major job to re-do ! I actually think the room has tremendous potential. The size looks great. Yes, the carpeting is a negative, but I think the roofline and windows are actually pretty fantastic! They add a great deal of character if done well. I can't wait to see what you do. I'm quite sure it will be wonderful! 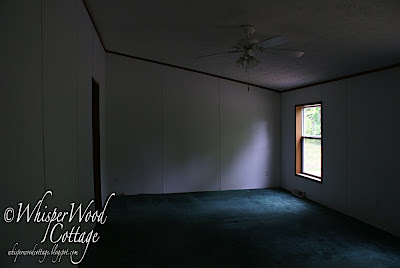 What great possibilities this room has! I inherited a room in my old house that had the strips of wood on the walls. Once you paint it your chosen color, it's really not so bad. I'm excited to see what you do! We're fixing up an old house right now too and it seems we have some of the same stripes. Looks like little pieces of wood molding painted...right? At least it looked like that in one picture. We tore off tons of those in what will one day be our dining room. Renovation is hard work! Best wishes to you.